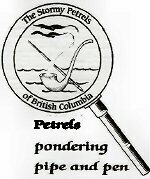 The “all aboard” has been called as the Stormy Petrels venture deep into the Valley. Many opinions, in the past, have been raised as to whether this part should stand on its own, and not be considered part of a Sherlock Holmes adventure. It could be considered a separate entity. I have heard some people refer to this section as “the long, boring part”. Delve into this Valley with an open mind, either having read it before, or if you are reading it for the first time, and form an opinion of your own…..
November Outing – 3rd Int’l Sherlockian Summit!